One of the deepest teachings of Confucius may have been the superiority of personal exemplification over explicit rules of behavior. His moral teachings emphasized self-cultivation, emulation of moral exemplars, and the attainment of skilled judgment rather than knowledge of rules. Confucian ethics may be considered a type of virtue ethics. His teachings rarely rely on reasoned argument and ethical ideals, and methods are conveyed more indirectly, through allusion, innuendo, and even tautology.The Confucian theory of ethics as exemplified inLǏis based on three important conceptual aspects of life -- ceremonies associated with sacrifice to ancestors and deities of various types; social and political institutions; and the etiquette of daily behavior. It was believed by some that LǏ originated from the heavens, but Confucius stressed the development of LǏthrough the actions of sage leaders in human history. His discussions of LǏ seem to redefine the term to refer to all actions committed by a person to build the ideal society, rather than those simply conforming to canonical standards of ceremony. These are primarily ethical,rather than analytical-logical or metaphysical in nature, and include Confucius’ claim that Tian (Heaven) is aligned with moral order but dependent upon human agents to actualize its will; his concern for li (ritual propriety) as the instrument through which the family, the state, and the world may be aligned with Tian’s moral order; and his belief in the “contagious” nature of moral force by which moral rulers diffuse morality to their subjects, moral parents raise moral children, and so forth.As with the person of Confucius himself, scholars disagree about the origins and character of the Analects, but it remains the traditional source for information about Confucius’ life and teaching. Most scholars remain confident that it is possible to extract from the Analects several philosophical themes and views that may be safely attributed to this ancient Chinese sage. The tradition that bears his name -- Confucianism (Chinese: Rujia) -- ultimately traces itself to the sayings and biographical fragments recorded in the text known as the Analects (selected sayings). The Analects, or Lunyu, also known as the Analects of Confucius, is the collection of sayings and ideas attributed to the Chinese philosopher Confucius and his contemporaries, traditionally believed to have been written by Confucius' followers. In the Analects, Confucius presents himself as a transmitter who invented nothing. He lays the greatest emphasis on the importance of study, and it is the Chinese character for study that opens the text. Far from trying to build a systematic or formalist theory, he wanted his disciples to master and internalize the old classics, so that their deep thought and thorough study would allow them to relate the moral problems of the present to past political events (as recorded in the Annals) or the past expressions of commoners' feelings and noblemen's reflections (as in the poems of the Book of Odes). The core of Confucianism, is Humanism,or what the philosopher Herbert Fingarette calls the secularas sacred. Confucianism focuses on the practical, especially the importance of the family, and not a belief in gods or the after-life. Confucianism, broadly speaking, does not exalt faithfulness to divine will or higher law. This stance rests on the belief that human beings are teachable, improvable, and perfectible through personal and communal endeavor -- especially self-cultivation and self-creation. Confucian thought focuses on the cultivation of virtue andmaintenance of ethics. Some of the basic Confucian ethical concepts and practices include Ren, Yi and Li. Confucianism holds one in contempt, either passively or actively, for the failure of upholding the cardinal moral values of Ren and Yi. Ren is an obligation of altruism and humaneness for other individuals. Yi is the upholding of righteousness and the moral disposition to do good. Li is a system of norms and propriety that determines how a person should properly act in everyday life. IChing (Book of Changes), is generally accepted as the earliest of the classics, shows a metaphysical vision -- which combines divinatory art with numerological technique and ethical insight; philosophy of change sees cosmos as interaction between the two energies yin and yang -- universe always shows organismic unity and dynamism. The book contains a divination system comparable to Western geomancy or the West African Ifá system. Classic of Poetry (Book of Songs) is the earliest anthology of Chinese poems and songs. It shows the poetic vision in the belief that poetry and music convey common human feelings and mutual responsiveness.A collection of 305 poems divided into 160 folk songs, 105 festal songs sung at court ceremonies, and 40 hymns and eulogies sung at sacrifices to gods and ancestral spirits of the royal house. Book of Documents (Book of History) is a compilationof speeches of major figures and records of events in ancient times and embodies the political vision and addresses the kingly way in terms of the ethical foundation for humane government. The documents show the sagacity, filial piety, and work ethic of Yao, Shun, and Yu. They established a political culture based on responsibility and trust. Their virtue formed a covenant of social harmony,which did not depend on punishment or coercion. Book of Rites describes the social forms, administration, and ceremonial rites of the Zhou Dynasty. This social vision defined society not as an adversarial system based on contractual relations but as a community of trust based on social responsibility. The four occupations -- or four categories of the people -- was a hierarchic social class structure. In descending order, these were the “shi” (scholars), the “nong” (farmers), the “gong” (artisans and craftsmen) and the “shang” (merchants and traders). Spring and Autumn Annals chronicles the period to which it gives its name -- Spring and Autumn Period (771-476BC). These events emphasize the significance of collective memory for communal self-identification, for reanimating the old as the best way to attain the new. The importance of education and study is a fundamental theme of the Analects. For Confucius, a good student respects and learns from the words and deeds of his teacher, and a good teacher is someone older, who is familiar with the ways of the past and the practices of antiquity. 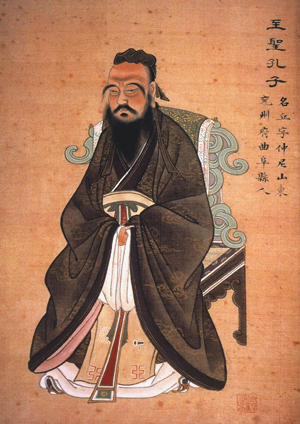 Confucius emphasized the need to find balance between formal study and intuitive self-reflection. When teaching, he is never cited in the Analects as lecturing at length about any subject, instead he challenged his students to discover the truth by asking direct questions,citing passages from the classics, and using analogies. He sometimes required his students to demonstrate their understanding of subjects by making intuitive conceptual leaps before accepting their understanding and discussing those subjects at greater levels of depth. The Four Books are Chinese classic texts that illustrate the core value and belief systems in Confucianism. They were selected by Zhu Xi in the Song Dynasty to serve as general introduction to Confucian thought, and they were, in the Ming and Qing dynasties, made the core of the official curriculum for the civil service examinations. Great Learning: Originally one chapter in the Classic of Rites. 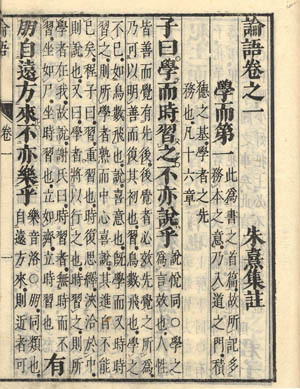 It consists of a short main text attributed to Confucius and nine commentary chapters by Zeng Zi, one of Confucius' disciples. Its importance is illustrated by Zeng Zi's foreword that this is the gateway of learning. It is significant because it expresses many themes of Chinese philosophy and political thinking, and has therefore been extremely influential both in classical and modern Chinese thought. Government, self-cultivation, and investigation of things are linked. Doctrine of the Mean:	Another chapter in Classic of Rites is attributed to Confucius' grandson Zisi. The purpose of this small, 33-chapter book demonstrates the usefulness of a golden way to gain perfect virtue. It focuses on the way that is prescribed by a heavenly mandate, not only for the ruler, but everyone. To follow these heavenly instructions by learning and teaching will automatically result in Confucian virtue. As heaven has laid down the way to perfect virtue, it is not that difficult to follow the steps of the holy rulers of the past -- if one only knows the right way. Analects is compilation of speeches by Confucius and his disciples, as well as the discussions they held. Since Confucius' time, the Analects have heavily influenced the philosophy and moral values of China, and other East Asian countries as well. The imperial examinations started in the Jin Dynasty, whichwere eventually abolished with the founding of the Republic of China, emphasized Confucian studies and expected candidates to quote and apply the words of Confucius in their essays. Mencius A collection of conversations of the scholar Mencius with the kings of his time. In contrast with the sayings of Confucius, which are short and self-contained, Mencius consists of long dialogues with extensive prose. 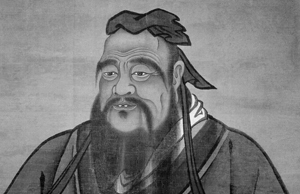 Confucius' political thought is based on his ethical thought. He argues that the best government is one that rules through rites and people's natural morality, rather than by using bribery and coercion. Confucius' political beliefs were rooted in his belief that a good ruler will be self-disciplined, govern his subjects through education and by his own example, and seek to correct his subjects with love and concern rather than punishment and coercion. If the people be led by laws, and uniformity among them be sought by punishments, they will try to escape punishment and have no sense of shame. If they are led by virtue, and uniformity sought among them through the practice of ritual propriety, they will possess a sense of shame and come to you of their own accord. This "sense of shame" is an internalization of duty, where punishment precedes evil action, instead of following it in the form of laws as in “Legalism”. Confucius’ political theories were directly contradictory to the Legalistic political orientations of China's rulers, and he failed to popularize his ideals among China's leaders within his own lifetime. Convinced that his teachings had not made a significant impact on Chinese culture, Confucius in 479 BC in Qufu, China, a year after losing his son, Tzu-lu, in battle. His followers held a funeral and established a mourning period in his honor. As of 4th century BC, Confucius was regarded as a sage who had deserved greater recognition in his time. By 2nd century BC, during China’s first Han Dynasty, his ideas became the foundation of the state ideology. Today, he is widely considered as one of the most influential teachers in Chinese history.